The maximum number of slots in an Onslaught is 50, including the slot for the initiator's warriors. 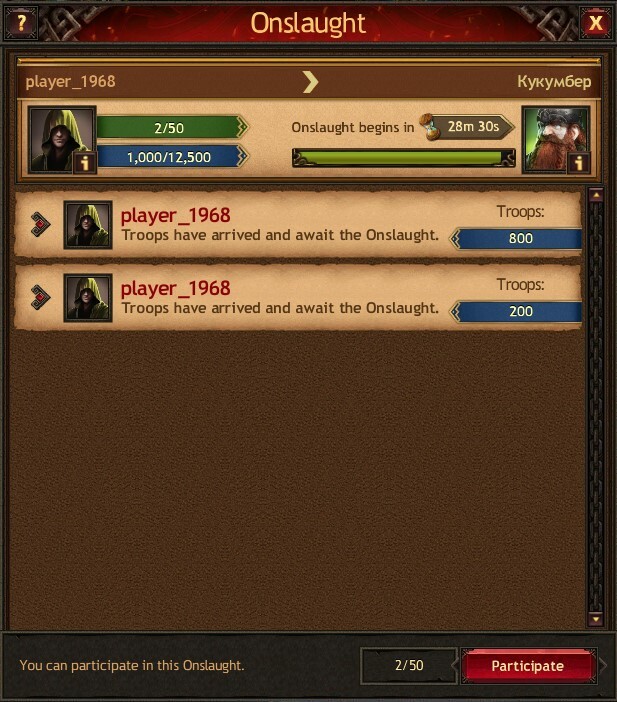 One troop occupies one slot. 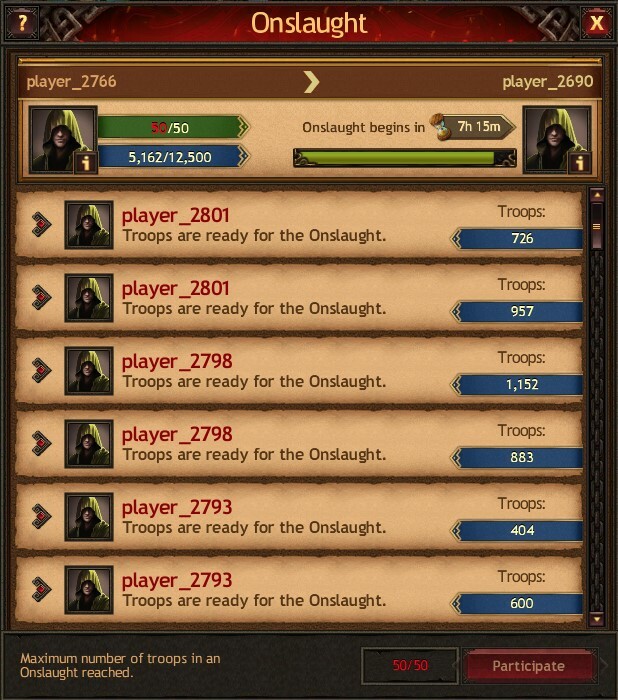 Every clansman can send a maximum of two troops on an Onslaught. A Jarl can be the initiator of only one Onslaught. However, they can join their own Onslaught by sending one more troop if their Hero/Hero's Double and Shaman are in different troops. 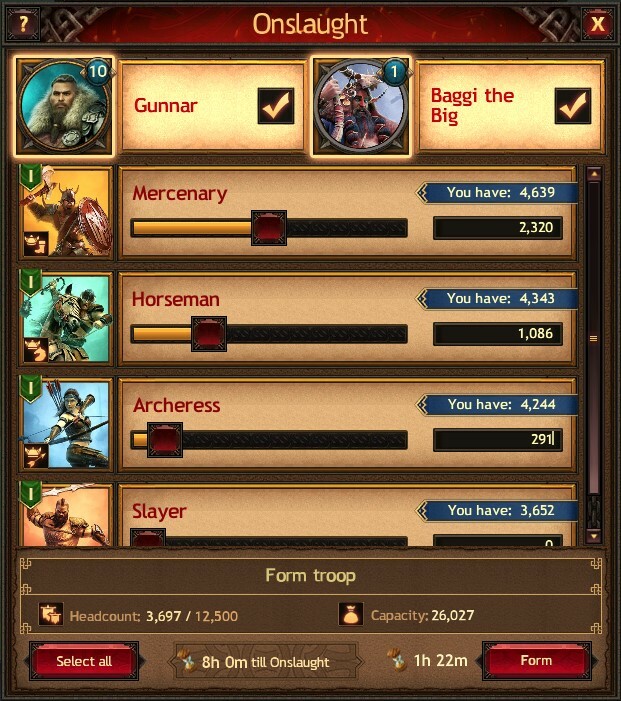 The bonuses of the Hero, Hero's Double, and Shaman affect only the troops they are leading. A troop cannot be sent on an Onslaught without a leader. Please also remember that scouts don't participate in Onslaughts. The total number of troops in an Onslaught depends on the level of the War Bloc in the initiating Jarl's Town, the Knowledge they have learned in the Oracle and Shamans' Residence, the Hero/Shaman Skills they have upgraded, their equipment, the boosts they have activated, and the Reputes they have received. The number of troops sent to participate in an Onslaught depends on the level of the Shrine of Odin in the participants' Towns, the Knowledge they have learned, and the boosts they have applied. By using the Warrior Number in an Onslaught boost, the initiating Jarl can summon more warriors for an Onslaught. Important: the boost must be activated before forming an Onslaught. If the number of Onslaught participants has reached the limit, it's highlighted in red. While troops sent by other Jarls to participate in an Onslaught are in the initiator's Town, they fulfill the reinforcement function and will defend the Town if it is attacked during that time. Meanwhile, the bonuses from the Wall and Watchtower in the initiator Jarl's Town don't affect the reinforcements. The initiator can cancel the Onslaught while it's at the troop gathering stage. If they cancel it, then troops that are marching to their Town or that are already there return to their home Towns. If all troops present in the initiator's Town are destroyed before the Onslaught starts, then the Onslaught is canceled. Troops that decide to join the Onslaught don't relocate to the initiator's Town immediately, but march there at the usual pace that depends on the warriors' speed. The participating Jarls can increase the marching speed of their troops by using boosts. If the troops don't reach the initiator's Town before the Onslaught starts, they return to their home Towns. 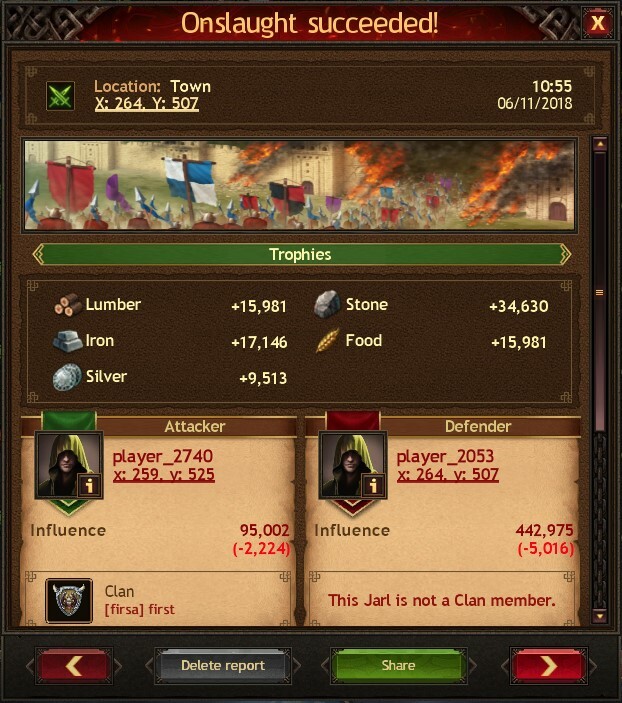 When an Onslaught is in process, it's impossible to quit your Clan, disband it, or expel the initiating Jarl. You can do this during the troop gathering phase, or after the Onslaught. If the battle ends in success, then all plundered resources are divided between the Onslaught participants depending on the capacity of the warriors left alive after the attack. After the battle is over, everyone who participated in the Onslaught receives a report where the initiating Jarl is shown as the attacker, and the enemy Jarl is shown as the defender. After the Onslaught, all troops that are alive return to their Towns without entering the initiating Jarl's Town.